Nowadays when you visit Genoa, it's impossible not to take a "under the sea" tour in the largest Italian aquarium. It is managed by Costa Edutainment SpA , one of Italy's leading management organizations for large public and private structures that are involved in leisure, cultural and educational activities and scientific research. The word "edutainment" is the fusion of education and entertainment which is precisely the company's aim. In 1988 the City of Genoa employed the famous architect Renzo Piano to reconstruct the Porto Antico, the famous Genoese seaport for the Expo '92 Genova, the celebration of the 500 years of the discovery of America. 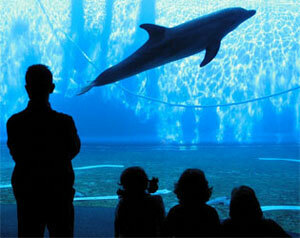 The work included also the Aquarium of Genoa and Bigo, the panoramic elevator. Inaugurated in the 1992, in the occasion of the 500th anniversary of the Columbus' "discovery" of the New World, it is the 2nd largest aquarium in the world. It will take you about 2 hours and 30 minutes walk between amazing cold sea, tropical sea, Mediterranean and sweet water pools. When the aquarium was enlarged it was used the hull of a ship called Nave Italia, an almost rustic part of the aquarium, where you can experience the very authentic contact with these sea creatures: The touching pools! You can actually put your hands in these open polls and gently pet the animals, not an everyday experience, right? Beside the sea tour, you can also take a walk in the tropical forests zone, the home of many different species. If you would like to hear and see colibrì birds, only for €2 extra, there is a special garden-room where these creatures fly freely among people. For those who were impressed, and have more time, there is a new offer: Aquarium Village pass. It allows you to visit all the Costa Edutainment facilities: Aquarium of Genoa, Biosfera (an ecosystem of million years ago), Bigo (the panoramic lift 40 meters above the sea), La città dei Bambini ( 90 science games for children), Galata museo del mare, one free ride on the miniature train that connects all the facilities. Easy to get to, it's situated at Ponte Spinola, in the 16th century ancient harbor of Genoa and is opened 365 days a year.